Growth hacking is a mindset. I am sure that you are equipped with the right attitude to make your business grow. You have to make sure the rest of your organization will not be left behind. Accomplish this in 4 steps. I have said it before: growth hacking is primarily a mindset. It is not thinking in terms of long campaigns or of buying expensive advertisement spaces. It is the desire to constantly improve and discover where the opportunities for growth are. Your entire organization should be involved in order to accomplish real growth. Below, I will explain which culture your business should embrace in order to grow quickly. Because of this fact, you need a less hierarchical workplace, one where everyone is allowed to speak out. This will fuel more diverse opinions that will reduce the risk of missing the boat. Take, for example, the software company Adobe. Through their Kickbox Program, everyone in the organization can request a box that includes, among other things, a credit card in the amount of ten thousand dollars, which can be used to make new discoveries. “Adobe has decentralized the innovation process and introduced the affordable loss principle: It does not mind losing ten thousand dollars if it means they learn something from it,” as Matthijs succinctly put it. Organizations are constantly seeking new and different ways to reinvent their product delivery. 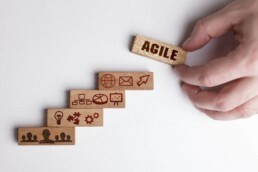 During the past several years, the development areas of organizations have begun to feel the benefits of working with an Agile Way of Thinking. In other words, they have created the processes, tools, and training required to be able to respond quickly to customer needs and to market changes, all while controlling costs and quality. As part of its digital IT strategy, the Cisco Cloud and Software IT (CSIT) organization wanted to replace periodic major releases with continuous delivery of new features. To accomplish this, Agile development was adopted. The results were amazing: Cisco became more efficient and products were delivered on time. Building a minimum viable product (MVP) is a great way to test your product in the market. An MVP is a product with just enough features to satisfy early customers, while also providing feedback for future product development. Gathering insights from an MVP is often less expensive than developing a product with more features. At RevelX, MVPs are one of our favorite tools to help organizations grow. TVM verzekeringen is a case in point. This Dutch insurance company is specialized in the transportation industry, and found out that many independent truck drivers find it challenging to get all paperwork and requirements in place to start driving. As a result, we built a simple tool that truck drivers can use in order to check what paperwork they have to fill out, such as the insurance they need. As of now, this tool is being tested. If you really want to grow, it is an absolute necessity to implement a process of analyzing, measuring, and learning to become a little better every day. On the one hand, this means you and your co-workers have to use testing and data to stay ahead of the competition. On the other hand, learning has to do with educating oneself. There is a wide array of possibilities. An organization with a tight budget can ask an employee to follow some free online courses from Google. A business can finance an employee’s course at night school. A multinational corporation such as Cognizant even has its own academy. Oh, and prepare yourself for some amazing news from RevelX about learning opportunities. Follow this blog or our social media, and we will keep you posted!